This week it was time to face the facts: there is about a month to go until the planned launch and still plenty of things to do. In the imaginary world, everything would have been done already during the winter and one could just wait for the ice to melt from the harbour. However, I guess that it is a law with boats, that one needs to have that spring rush to get everything done. All in all, it was time to roll up the sleeves and start tackling the undone projects. Now that the temperature is higher and the air drier in the shed, I noticed that some of deck caulking has lost its grip of the teak and needs to be replaced. 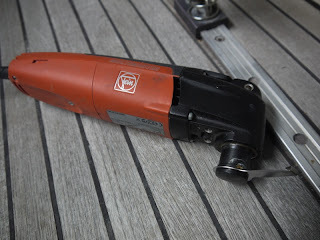 Teak expands when wet, so later in the season it might be difficult the locate the potential problem areas on the deck. Especially as it might take a week for the teak to dry thoroughly. 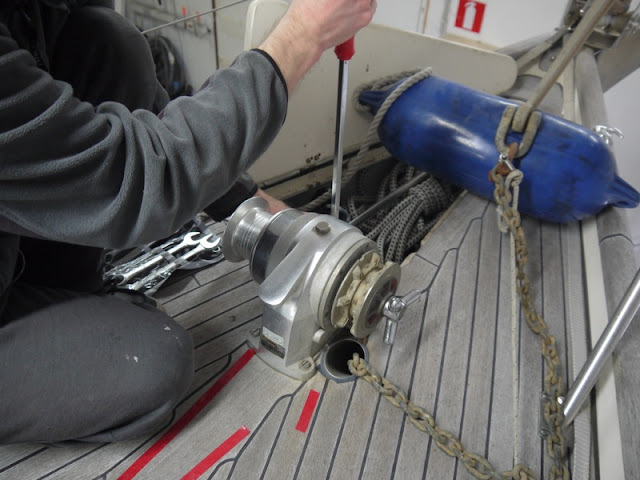 The area around the anchor windlass looked suspicious so we decided to remove the windlass and replace all the caulking there. The (manual) Lofrans Royal anchor windlass needs also some maintenance, since it is only working at half speed (i.e. only when the handle is pushed forward). I took the windlass home to give it a closer look. Jarkko Marsh borrowed us his Fein Multimaster tool, which has a special blade for removing teak deck caulking. It proved especially handy in opening straight seams; it is many times faster than the screwdriver/carpet knife method, which I have been using previously. However, opening curved seams is also difficult with Fein and needs still some practice. Also the keel project has taken leap forward this week. 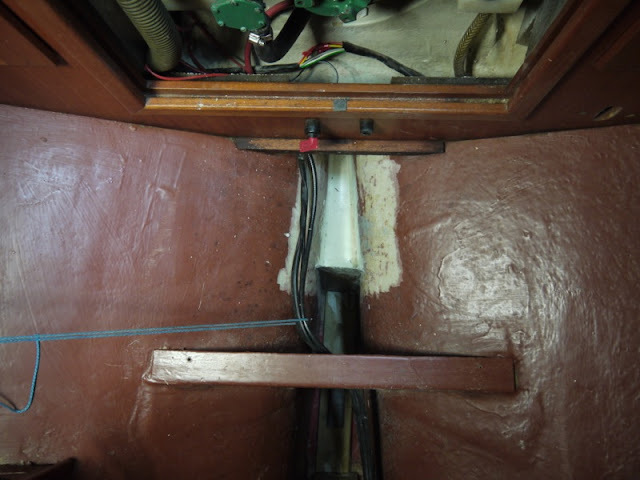 Earlier this year, we discovered that there was moisture in the area under the bilge. Multiple holes, that were drilled into the keel, are now filled and laminated. 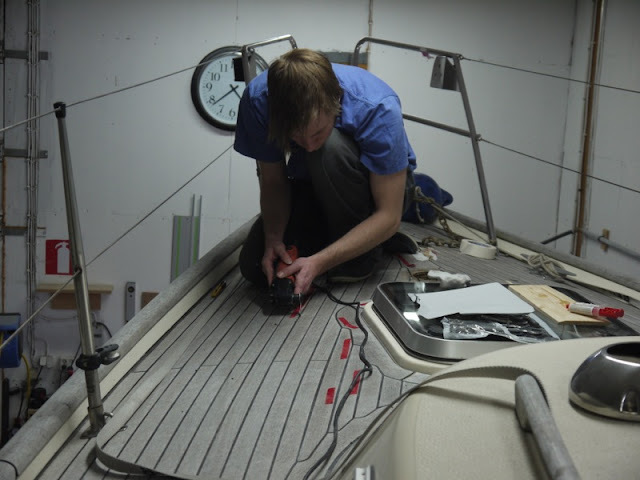 Also the bilge area has been modified quite a bit: Jarkko came up with an idea of filling the back end of the bilge with epoxy foam. 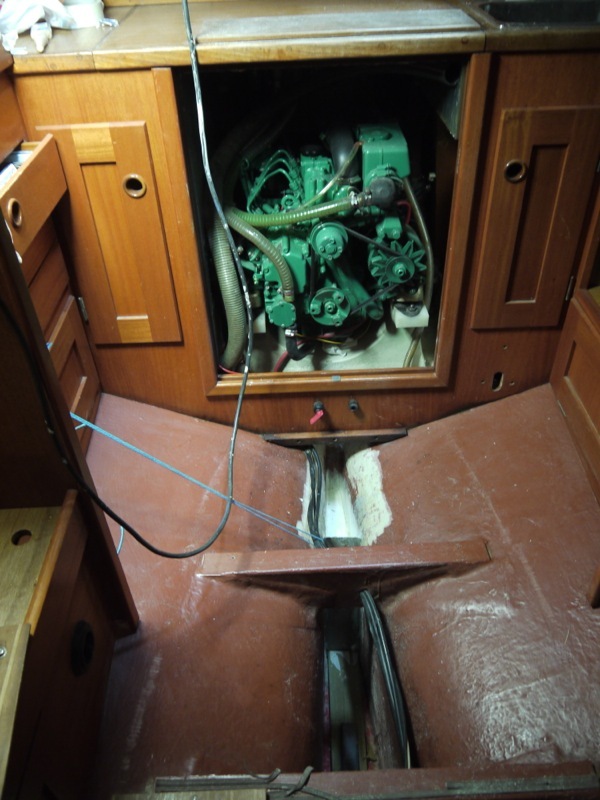 This is practical for two reasons: first of all, the back of the bilge sump is deep and narrow, so it is very a difficult place to operate and laminate properly. The second reason is, that due to the deepness, it is also difficult to keep the sump clean and dry. After all, I believe, that the bilge water is to blame for the moisture in the keel. With this modification, there will be slightly less volume in the bilge, but it will be much easier to keep the sump tidy. The back end of the bilge filled with epoxy foam. Needs still to be laminated over. Still plenty of volume remaining in the bilge after the modification.